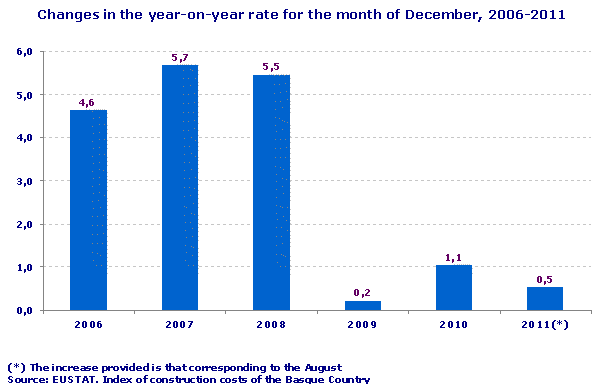 Construction Costs in the Basque Country fell by 0.2% in August 2011 with respect to the previous month, whilst the year-on-year rate for this month rose by 0.5%, according to EUSTAT data. With regards to the previous month, in August 2011, labour costs witnessed no variation (0.0%), whereas raw material costs fell by 0.3%. 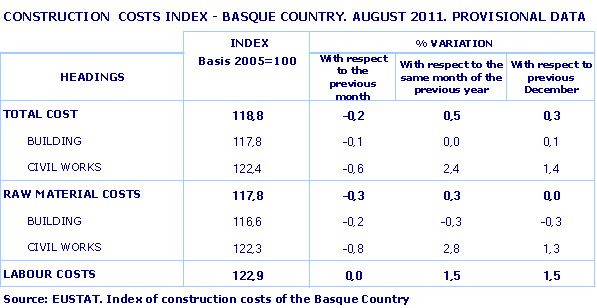 The Building and Civil Works sub-sectors presented a similar evolution, although with a different level of intensity, in the month of August in terms of the cost of raw materials, with a fall of 0.2% in comparison with the previous month in raw materials consumed by Building and a more marked descent of 0.8% in materials consumed by Civil Works. The year-on-year evolution of these two sub-sectors illustrates that costs of raw materials in Building fell 0.3%, whilst costs in Civil Works rose by 2.8%. Electricity, Gas & Steam (21.0%), Oil Refining (20.0%), and Metallurgy (8.0%) stood out amongst the prices of raw materials used by the sector that experienced the highest inflation rates over the last twelve months. In contrast, raw materials from extraction Industries (-6.4%), the manufacture of other non-metallic minerals (0.4%) and the manufacture of furniture and other manufacturing industries (1.1%) registered a reduction or less significant rises in annual prices (August 2010 to August 2011).